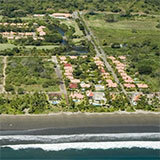 This lovely 2 story “Chalet” is located in Alajuela close to the Poas Volcano. Living Area:340m2 > Total Property Area. Sitting in a wooded area overlooking the Province of Alajuela, this 4 bedroom home comes with 2 full baths, living room, kitchen and laundry room with a large patio on the first floor and balcony on the second. Costa Rican Hardwoods were used in the second story construction with cement walls and ceramic tiles on the ground floor. A ceramic tiled garage port has room for 2 cars. If you are looking for a private property surrounded by woods close to all the action and services of the city, this comfortable “Chalet” might be for you. Call our office today for more information.